Toddler soccer cleats - which shoes will be best for your child? Toddler soccer cleats – which shoes will be best for your child? If you’re in the market for a new pair of soccer cleats for your toddler then there are a huge number of options for you to choose from. As soccer has grown in popularity over the last few years more and more toddler soccer gear has come on the market. To help you sift through all of the available options we’ve reviewed our five favorite pairs of soccer cleats and toddler indoor soccer shoes below, but before we get to the reviews here are a few things you should bear in mind when buying a new pair of cleats for your kids. Cost – Toddlers tend to go grow out of shoes pretty quickly, so you might not want to spend megabucks on a pair of cleats. We wouldn’t advise going too cheap though. Style – Soccer cleats for toddlers tend to come in a number of different colors. Ideal if your toddler is starting to get a bit choosy! Materials – Most toddler sneakers and soccer shoes are made of synthetic leather, this means the shoes are light durable and not too expensive. Fit – Remember that soccer socks are thicker than normal socks so you might want to go a size bigger than your child’s normal shoe. Diadora Forza MD Soccer Cleats These soccer cleats come in a range of different colors which means that you can choose the ideal color whether you’re looking for toddler boy or toddler girl soccer cleats. The shoes have a synthetic upper and sole. The cleats have a fold over velcro tongue so that the laces on the shoes can be covered over and secured by the tongue meaning your childs laces are less likely to come undone whilst they’re playing. The sole of each boot has 14 cleats and Diadora have added additional cleats to the heels of the cleats to provide increased stability to the shoes. 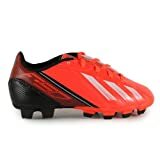 People who used the cleats report them to be an excellent pair of first soccer cleats, the choice of coloring on the shoes means that you will be able to pick a pair that suits your child down to the (soccer) ground and we think that they are an excellent pair of shoes to buy. PUMA Attencio II I FG Firm Ground Jr Soccer Cleats These Puma shoes come in a variety of colours from a fairly standard black to more outlandish fluorescent greens and pinks. We’ve seen these cleats described as “girly” online but they could easily suit a boy soccer player given the variety of colors available. The shoes are predominantly made from synthetics, with a synthetic upper and sole. The cleats are light and whilst their synthetic make up might mean they wear out more quickly they are unlikely to show any significant signs of wear and tear before your child has outgrown them. The outsoles of the shoes are constructed from TPU (thermoplastic polyurethane) which in layman’s terms means they should boast superior scuff and impact resistance as well been able to cope well in the cold weather. The cleats are designed for use firm ground and the molded studs should provide a stable basis for quick turns and mazy dribbles. All in all we’d highly recommend this pair of Puma toddler cleats. Adidas Toddler/Little Kid Goletto TRX HG Soccer Shoe These Adidas cleats boast the classic three stripe Adidas design which may well appeal to Moms and Dads who fondly remember their first pair of soccer cleats. We think these shoes look a little more “grown up” than some of other shoes on the market so they maybe the ideal choice for the young player who wants a pair of “big girls (or boys)” shoes. The shoes boast a synthetic leather upper and a manmade sole. The shoes cleats boast the patented Adidas TRX (or Traxion) which probably means nothing to you, but the cleats have four molded studs on the heal and 11 molded studs on the main part of the shoe. People have reported that the Traxion system gives good stability to soccer players and the shoes are s;specifically designed to be worn on hard ground. The Golettos are a nice pair of cleats and we wouldn’t hesitate to recommend that you took a look at them if you’re in the market for some new cleats for your kids. Adidas Kids F5 TRX FG J Red White Black If the Adidas Golettos remind us of the Adidas boots of our youth then the F5s maybe put us in mind of a more modern cleat. The shoes have a really shiny futuristic look to them and the styling has more of a nod to Adidas’s flagship F50 range rather than the more classic look of the Golettos – you could definitely imagine a young Lionel Messi wearing a pair of these shoes! The shoes have a synthetic upper and manmade sole that boasts the Traxion design. The cleat configuration differs slightly from that used on the Golettos as these cleats are designed to cope with firm rather than hard surfaces. Adidas markets these cleats with slogan “In this game, every gram counts” which is maybe a little grown up for a toddler’s cleat, but these shoes do seem to be aimed at the older end of the younger persons market. Vizari Verona FG Soccer Shoe If you’re not looking for a big name cleat like the two Adidas shoes reviewed above then you might very well be interested in these Vizari Verona Cleats.The shoes are styled in a very traditional black and white finish and may well remind of your first pair of soccer cleats. As an added bonus these cleats can be found online for less than $20 so if you’re on a budget or you’re not sure how much wear your toddler will get out of their cleats then these could be the ideal purcahse. The upper of these shoes is constructed from synthetic leather and they have a rubber sole. The cleats on the shoes are in the traditional circular style and there are four cleats on the heel section of each shoe. The Veronas have a number of glowing reviews online and we would highly recommend them if you are in the market for a pair of toddlers football shoes. This entry was posted in Children's cleats, Cleats, Indoor Soccer, Toddler Soccer Cleats on May 16, 2014 by admin.